Ever go through a drawer and find random stuff from when you're a kid, just to get nolstagic about it and wanna play with it again? That just happened to me and tamagotchi. I was talking to a friend about ebay and mentioned that Pokémon Pikachus are $50 on ebay now. (WHY) And he brought up tamagotchi, that caused me to go through my drawer full of them and show him the ones I still had. 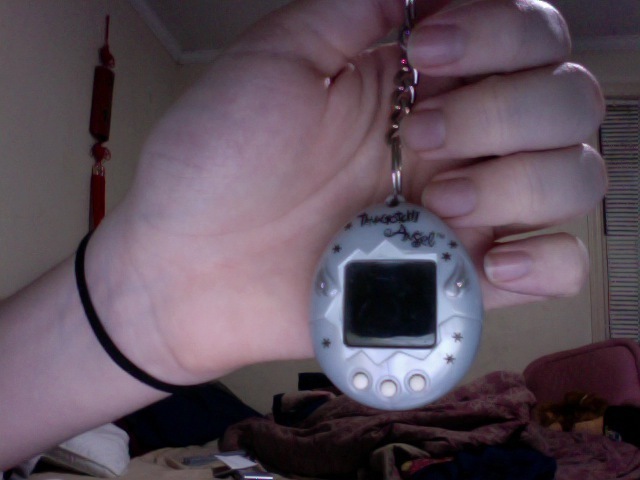 Now he just left and I'm just like "Welp Imma just write about these haha"
I was WAY into Tamagotchi as a kid, I had to get one as soon as it came out. I loved it, cared for it, picked up it's poop. It died I cried. Then we went over the process over again. This of course lead to me wanting every single virtual pet toy I saw when they had their popularity boom. At one point, I think I was caring for like 3 or 4 pets at a time. With Tamagotchi always being on top. My grandmother never let me take them to school, but I presevered... which ended up with me getting my Giga Pet T-Rex solen, haha. I loved the cheapo chinese no name ripoffs too, they were always so goofy. So, without further adieu, let's show off my collection! 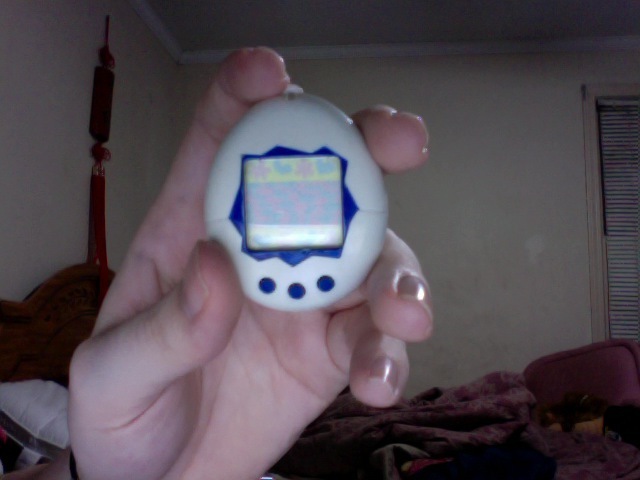 My first Tamagotchi! :) Which was "White just like a real egg". I got it when it first came out in 1997, I was the last kid to get one before they sold out, yay! Oddly enough I was the only kid I actually knew who had a white one. Everyone else had yellow, red, blue... all sorts of colors. This guy was basically the commander of my Virtual pet army as a kid. I clearly remember my first pet growing to become a 17 year old mimigotchi. It then died one day when my parents wouldnt let me take him... somewhere. I forget where, the death of my beloved pet was such a traumatizing event. I cried on my bed for about 30 min... then started a new one :P I remember it didn't support naming. But that was okay. We were so close, we didn't need names. Also it ate bread and got shots when it got sick. I eventually got one to 99 years old and it's battery died. Ah good times. I got THIS next christmas! A gold one! Some sort of limited edition, it's painted with some sort of really cheap gold paint. My parents got me 2 of them. One is still never opened in my closet. It's baised off the v2 model but kidna looks like the original (just because it lacks the name at the top). Also the paint is just SOOOOOOOO cheap. I can't express this enough. It's peeling off on the back in some places. One day it'll be white...... just like a real egg. Oh well I like gold things so it's cool. Giga pets! 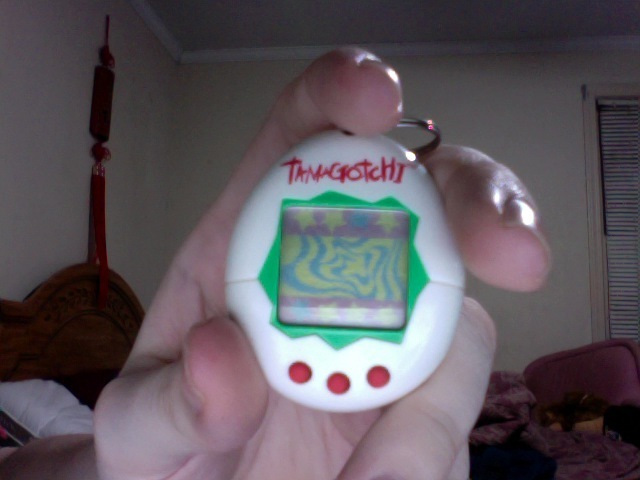 I was totally into these too in the heyday although Tamagotchi was totally better. 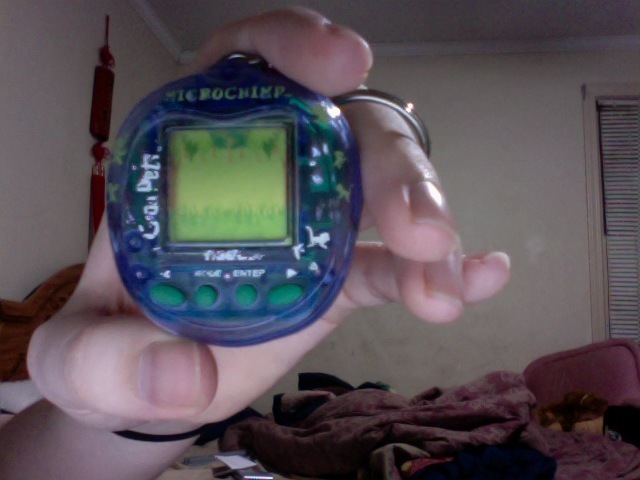 I had more Giga Pets than tamagotchi just because they were SOOOOOO cheap. Like $15 for a tamagotchi vs $5 for a giga pet. Plus Giga Pets were practically EVERYWHERE while only bigger stores had my little egg friends. 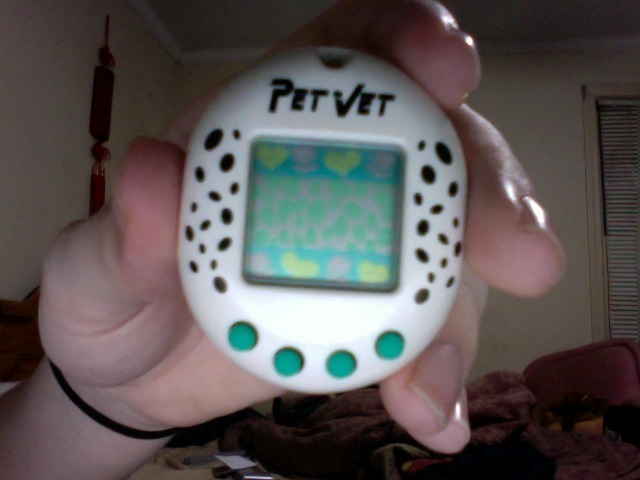 Giga pets were different than tamagotchis for various reasons. Even though I only know where the chimp is now, I had like, the dog the cat, the t-rex...and I dunno which others. There were interestingly exploitable as you could put them to sleep whenever you felt like it. They also had different games and such you could play with each one that kept the experience pretty fresh. 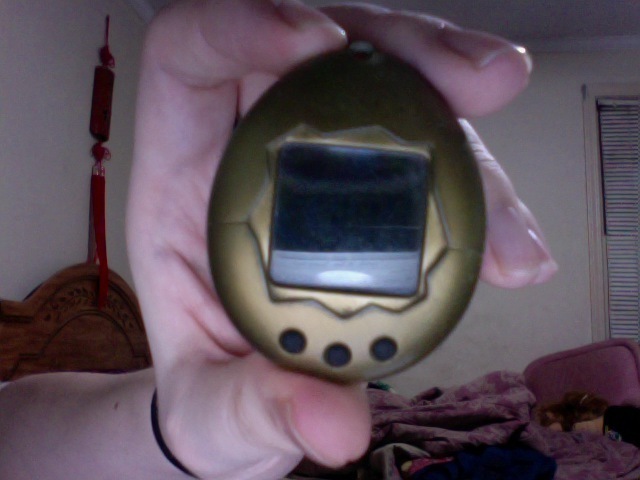 I had ALOT more friends with giga pets than I did with tamagotchi's, no doubt due to the price factor. Ever remember that advert in old EGMs with like 200 different virtual something, each one looking... really strange. Well those were all HK original virtual pets which were EVERYWHERE, especially when the fad was dying down. I got this one from my dad from god knows where, and it had kind of between tamagotchi and giga pets in terms of features. 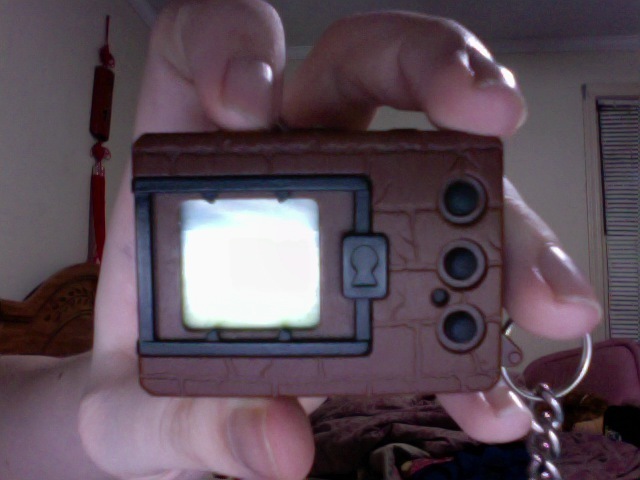 I know it had the ability to choose what kind of food to give it, something tamagotchi didn't get until years later. I had a fair amount of chinese knock offs, not nearly as many as I had giga pets, but they all fun, much like pirate video games. I remember one I got from Big lots was a wrist watch, with a dog in it. For some reason, the knock off chinese ones were often MORE expensive than the real thing. I remember seeing some for $30+. This is a good reason why I didnt have many, haha. ... Not that I didn't still love them. And I LOVED this game. It was the first Tamagotchi game (that I know of) and was awesome, it was pretty much a faster version of the LCD toy, but with more stuff to do, and more options to play with. 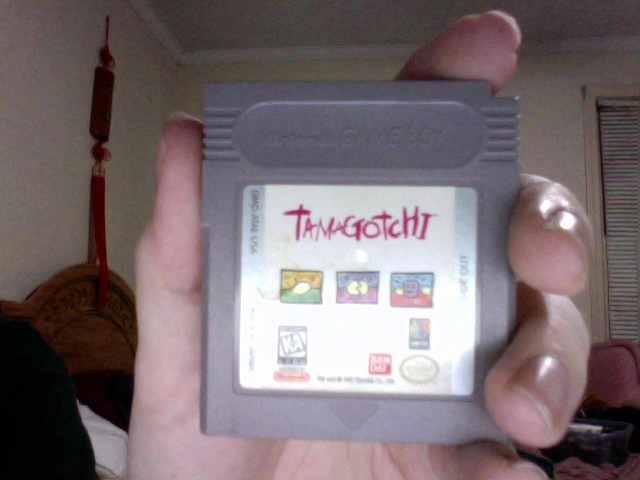 Between me and my cousin, we played this game a TON on the super gameboy. It's alot harder than the LCD games too IMO @_@ There was a math game and a base ball game ontop of the "look the same way" game, 5 different kinds of food to feed him, you could toilet train him, and put him in contests. You could also have 3 going at once time, which is harder than you'd think. Over all I'd reccomend it. Sadly I think all the modern tamagotchi games are mario party ripoffs but the Saturn one had sonic in it :O Cool. ... or maybe I can finally get that pink tamagotchi, haha. Yessss virtual pets. I love the pedometer ones so much. XD I walk around a lot regardless, but it's just so satisfying looking at it at the end of a day and seeing over 15,000 steps, haha. 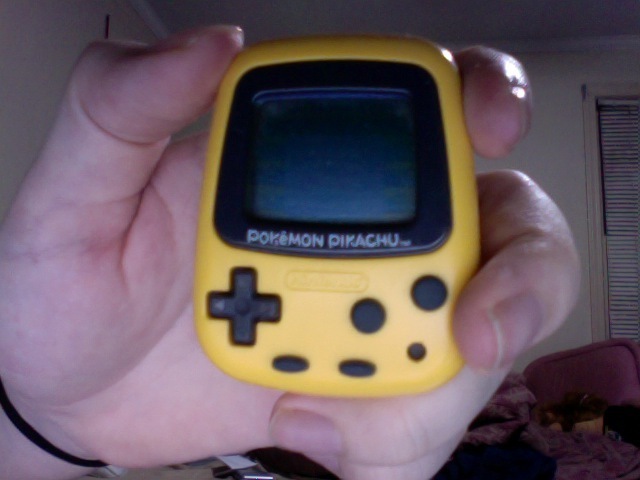 I'm saving my button batteries for when the PokeWalker gets released tho, so Pikachu is hibernating once again. I HAD A ONE TOO! It's funny how you mention you wanted the pink one. There weren't many toy stores around where I lived at the time, so places were always sold out, I finally got one put on hold for me, I told them I didn't care about the color at all, so when I got to the store it was the pink one LOL! Although people were like "why is yours pink, you're a boy?!" I secretly loved it hehe, and now it would be perfectly fitting. I don't know what happened to it over the years.